This entry was posted in WebGL, Workshop and tagged WebGL, workshop on October 3, 2017 by Admin. This entry was posted in AR, VR, WebGL, Workshop and tagged AR, VR, WebGL on September 5, 2017 by Admin. OK, so “WebAR and WebVR” may have been a snappier title but also technically incorrect. “WebVR” is an actual standard still under development and “WebAR” doesn’t exist as such (oh look, I spoke too soon! It looks like it may be a pending standard, after all). The terms VR¹ and AR², along with MR³, RR⁴, ER⁵, XR⁶ and god knows what else can be used to mean a surprising variety of things (check Wikipedia for more info). These are supposedly convenient labels for different things on a spectrum, but I think they largely serve to muddy the water and are little more than an exercise in marketing bullocks. To this end, I prefer to just use the terms AR and VR. We’ll be browser based, so there’s no bulky, expensive or high-end equipment (although we might burn out your GPU or drain your battery). I’m using my Nexus 4 (ancient my modern standards). A tablet can be used for AR, but might be a bit awkward for VR 🙂 . While researching this article, I used a SketchFab cardboard and a pair of Go4D glasses. Neither was ideal, the cardboard provides an easy touch button input, while the Go4D has adjustable lenses. Both were needed for a proper experience, so I was sadly disappointed. Researching for this article is the first time I’ve used used VR for any length of time on a mobile, and it’s both literally headache inducing and arm tiring. I’ve found dedicated systems/headsets far more comfortable to use (although they do make my head hot). I’m not sure what caused the headaches, possibly poor resolution or poor placement causing eye-strain, adjusting the inter-ocular distance seemed to ease the problem. It’s evident that for prolonged use some kind of strap is required along with some kind of cushion for the nose. VR is based on old-fashioned stereoscopic viewing (and I do mean old-fashioned). The basic requirement is to provide the viewer with two slightly offset stereoscopic images giving the impression of depth. True “VR” is achieved by adding positional awareness — as the viewer moves the images change to reflect the viewer’s new point of view. Without positional tracking the VR experience is severely limited, only allowing the user to look around, resulting in an experience akin to 360° video. Teleporting is a practical alternative to moving around as this is already a widely used method of moving around in a virtual environment. 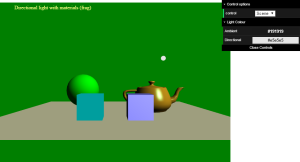 While the WebVR standard makes VR easier to implement, it’s not widely supported (at the time of writing only Edge, Firefox and Chrome for Android have limited support). Polyfills and various other hacks are used to achieve the necessary functionality. Ultimately, happily, all the required legwork has already been done by many brave, hearty souls, leaving us to simply find the API we like the most. A number of headsets are available, most notably the cardboard. The cardboard become uncomfortable after a short time. Recent iterations have moved away from the neodymium magnets, which was the most expensive part of the cardboard and could interfere with the magnetometer/compass functionality of the phone. AR has significantly more requirements as images additionally interact with the local visual environment (to some extent). 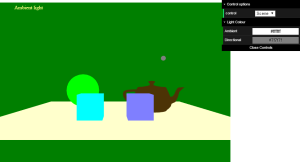 This entry was posted in AR, VR, WebGL, Workshop and tagged AR, VR, WebGL on September 1, 2017 by Admin. Each object gas its own basic coloured material. Still no lighting. This entry was posted in Workshop on May 30, 2015 by Admin. 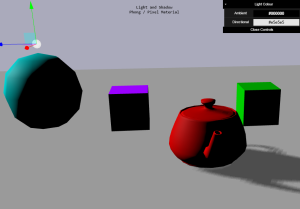 No lighting applied, each object within the scene is displayed with its colour. Each object looks like a silhouette with no visible detail. Ambient lighting is now applied to the scene. Ambient lighting is applied evenly to an object. 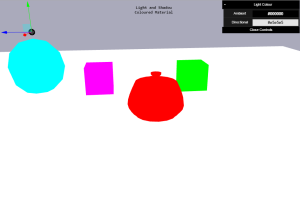 So, each object still looks like a silhouette with no visible detail. However the lightness of the scene can be controlled. But, note that the “light” is not affected by the ambient light as it only has an emissive material. 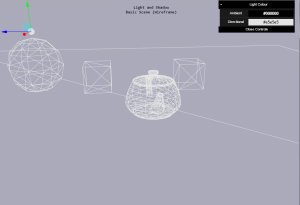 A directional light is added to the scene. 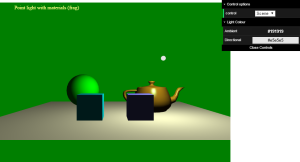 Again directional light is added to the scene. 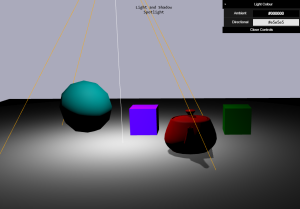 However, the lighting calculations are done in the fragment shader, making the lighting more accurate. 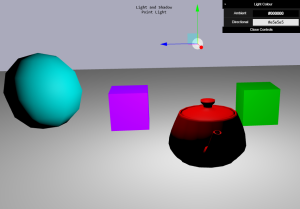 Support for all materials (ambient, emissive, diffuse and specular) is added to the scene. 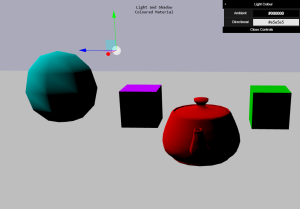 Setting these values appropriately simulates different materials such as gold or copper. A point light is added to the scene. A point light has a position as well as a direction so as it approaches an object it has a greater effect. This entry was posted in Workshop on April 23, 2015 by Admin. This entry was posted in Workshop on August 14, 2014 by Admin. This entry was posted in Workshop on January 7, 2014 by Admin.